This website and the information contained herein have been prepared by Montevideo Law, PC dba Dog Bite Law Group for informational purposes only and is not legal advice. Montevideo Law, PC dba Dog Bite Law Group designed this website to provide general helpful information to members of the public in need of an attorney licensed to practice in the State of California. The use of this website, and the sending or receipt of information does not create an attorney-client relationship between you and Montevideo Law, PC dba Dog Bite Law Group. Communication with Montevideo Law, PC dba Dog Bite Law Group through this website may not be considered privileged or confidential. However, a member of our firm would be pleased to discuss in greater detail the information at this website and its application to your specific situation. 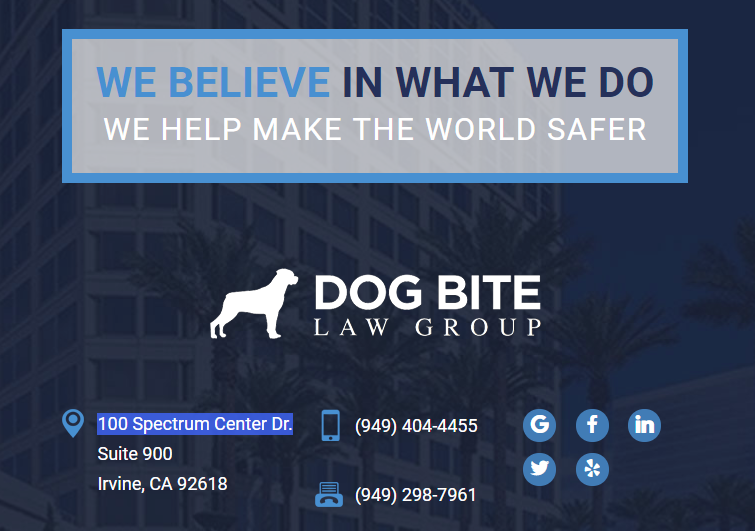 Montevideo Law, PC dba Dog Bite Law Group makes no representation that materials on this website are appropriate or available for use in jurisdictions other than California and accessing them from jurisdictions where their contents are illegal is prohibited. Those users who choose to access this website from other locations do so at their own risk and are responsible for compliance with local laws and regulations. Any statement, testimonial or endorsement contained herein does not constitute a guarantee, warranty or prediction regarding the ultimate result or outcome of your legal matter. If any result of any legal matter is portrayed in this website, please note that the result portrayed was dependent on the facts of that case, and that the results will differ based on different facts. Any link from this website to the website of a private, governmental, educational or other non-profit entity’s web page does not constitute, state or imply the existence of a relationship with Montevideo Law, PC dba Dog Bite Law Group. Information on this website may contain technical inaccuracies or typographical errors. The information contained on the website may be changed at any time without prior notification, or obligation. The information appearing on this website is of a general nature and does not constitute legal advice or opinions as to any viewer’s specific situation.